A classic, fine looking bottle. If you were of my generation, you’ll remember Dewar’s ads from magazines–often full-page ads, typically with a Scots Guard soldier in full regalia and some marketing flack typical for its day. These days I don’t notice many advertisements for Dewar’s. When I encounter the brand I’m on a commercial flight and I’ve asked what they have for scotch; it’ll be their White Label. In the marketing wars the brand appears to be outshone by the massive Johnnie Walker complex, but they still have a strong presence in bars in the U.S. They claim to be the fifth largest selling blended Scotch in the world and top selling Scotch in the U.S. Maybe Johnnie just advertises more? Notably, Dewar’s web site claims the White label is “The World’s Most Awarded Blended Scotch Whisky.” Maybe they just entered more competitions, I don’t know. I tried finding a list of their awards. Still looking. Dewar’s is owned by Bacardi, which claims to be the “largest privately held spirits company in the world” and indeed it earns multiple-billions of dollars in revenues. Dewar’s draws upon distilleries they control in Speyside (Craigellachie) and the Highlands (Aberfeldy, the primary component) to create Dewar’s blends. That’s info gleaned from Wikipedia, as apart from some flavor notes, their web pages have no information at all on the product. Or any product. No bragging about old pot stills or the water. Odd. Their packaging is in the classic style, very attractive and heavy on the heritage, as you can see to the right: “The Ancestor” and “TRUE SCOTCH” which is odd as there are laws in Scotland defining what you can call Scotch. Very wordy carton. Good, as the web site has a dearth of information. I would assume the 12 is just an aged version of White Label and bought a taster of the latter to compare. Normally I would email someone at the distillery and ask about a spirit’s provenance, but…no. Best you can get from Dewar’s is the Twitter handle to one of 3 ‘ambassadors.’ So I twitted one of them, Kara Anderson, about the provenance of the 12. No answer. 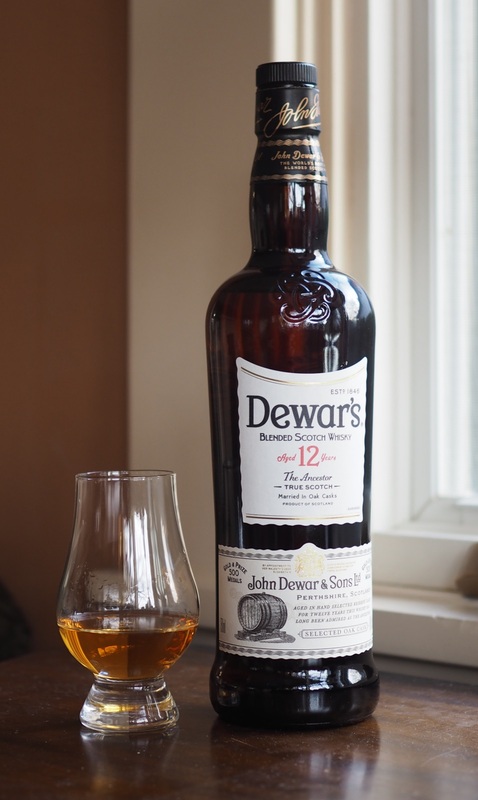 Fortunately, the carton has a wealth of information—we read that Dewar’s is over 100 years old, and that the 12 could be blend of up to 40 different whiskies. But who knows. We also read that, after blending (when the single malts would be mixed with grain alcohol), Dewar’s keeps the spirit in oak casks for an additional six months of marrying. They call this ‘double aged’ and this step would indeed impart some flavor, assuming the casks have some life left. Also, you can assume the malts used to blend the 12 have aged longer than the (NAS) White label. Hence we should expect a sturdier flavor profile from the 12. And it has that—where the White is a serviceable base for a mixer (I’ll have it with club soda on commercial flights) it offers no more than modest sweetness, a hint of spice and malt with an alcohol-forward finish. Not much on the nose. The 12 delivers a fuller nose with malt and peaty minerals and a smoother palate. Given that, what else can we expect from the 12? Why not compare to their primary competitor, Johnnie Walker Black, another 12-year old blend? You might review my whimsical JWB post here, where I note there are 43 whiskies in that blend. 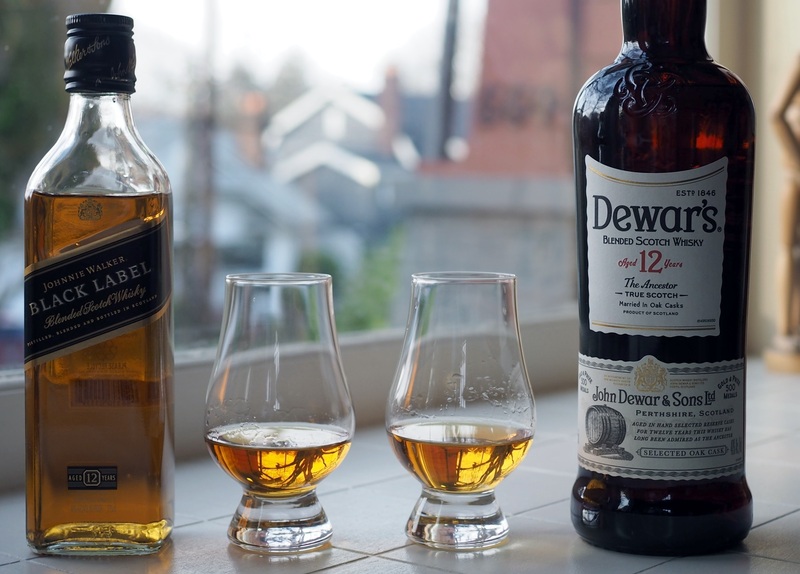 The Dewar’s 12 has more cereal on the nose, while JWB is a bit cleaner. The Dewar’s palate is sweet, Lyles golden syrup and not a hint of smoke, while the JWB is spicier, more complex, less sweet. Let’s get to the lowdown. Nose: Malty cereal, some oak spice, a little honeysuckle, hint of lemon. Palate: Smooth, Lyles golden syrup, a hint of spice but nor much (odd as there is more spice than sweet on the nose). Finish: Fairly long treacle finish. Some oak spiciness comes out. Bottom Line: At about $38 here on Oregon, and $2 less than Johnnie Walker Black, I’d say this is a good dessert whisky when you don’t want to pay more for a single malt. But then again, you could get the very solid Glenmorangie 10 (single malt) for the same price. 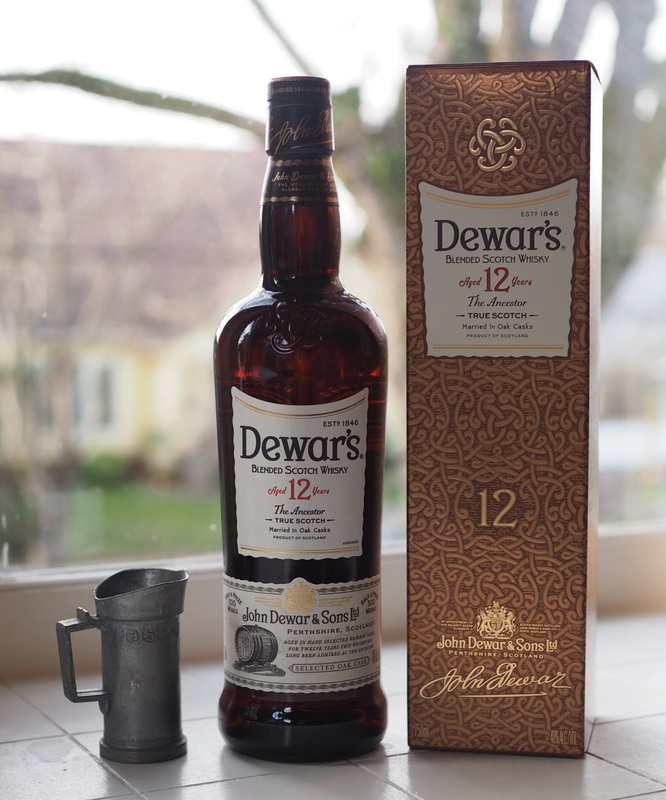 I think Dewar’s 12 would be a good first-timer’s whisky, as the sweet palate is not going to intimidate. For the sophisticated whisky drinker it’s not as interesting as American bourbons in the same price range or the Glenmorangie. Coming next, because I had it around I compare the White Label to Johnnie Walker Red. This entry was posted in Scotch-blends, Whisky and tagged Blended whisky, Dewars, Johnnie Walker, Scotch. Bookmark the permalink.